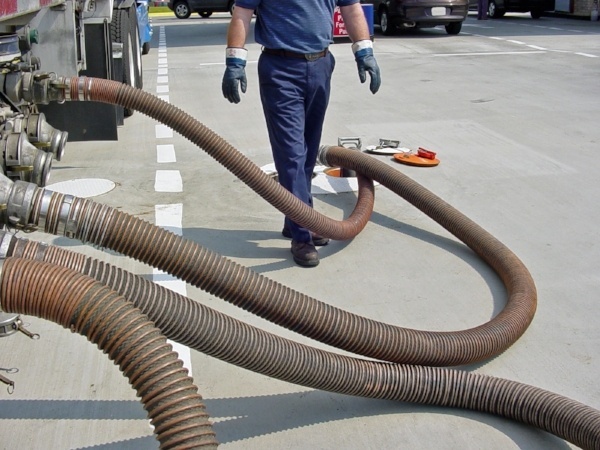 Static electricity is a serious concern when it comes to hose assemblies used in chemical transfer. The products they transmit fall into two categories: accumulator or non-accumulator. The movement of accumulator liquids (hydrocarbon-based liquids such as gasoline) transfers electrons from the insulator (rubber hose) to the accumulator liquid. Continued movement of these products through an assembly not capable of transferring this charge makes it susceptible to explosion or heat damage. Workers handling these assemblies can be exposed to extreme electrical shock similar to picking up a live 115-volt line. In addition, ungrounded assemblies conveying accumulator liquids can act as storage batteries. Depending on the product, it can take several minutes for the charge to dissipate after movement has ceased. So, even after the pump has been turned off, workers are still vulnerable to a significant electrical shock if they touch the metal couplings. Other industrial hose applications carry a risk of electrical shock or damage to the hose through the buildup of static electricity. Many workers have been surprised at the powerful shock they received from touching the metal fittings on a steam hose that was not properly grounded. All assemblers and users must follow the hose manufacturer’s guidelines for proper static grounding. Typical static grounding procedures use the built-in static wire (when present) or helical wires. Assemblies that require grounding must be tested for electrical continuity. This is done by taking a multimeter reading and comparing it to those supplied by the hose manufacturer. Not only should these assemblies be hydrostatically tested on a regular basis for serviceability, but they should be periodically checked for electrical continuity because in rare occurrences, the static wire or helical wire may fracture during use. The spark from touching a metal object is nature’s way of balancing out positive and negative charges. To balance the positive and negative charges in an industrial hose, the hose must be grounded properly. “Keep it safe” by testing these assemblies before installation and periodically thereafter. Call 877-963-4966 or email to speak to a product specialist about your specific application.